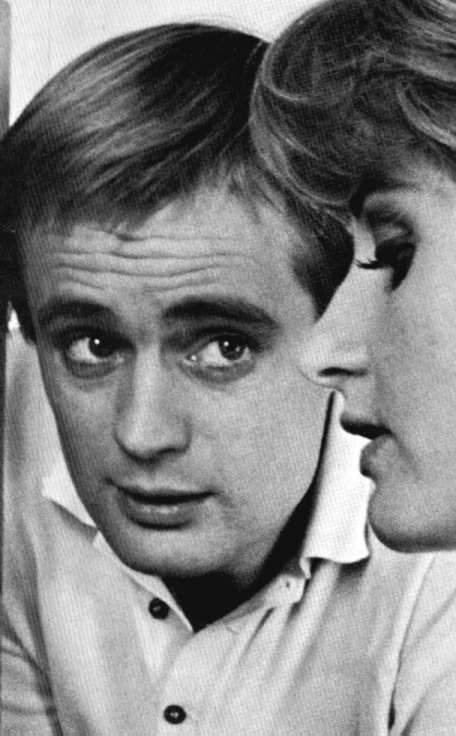 Actor David McCallum said here Friday (May 20th) he and his wife, Jill Ireland, have separated, but declined to comment on reports that they would seek a divorce. "Jill and I have maintained a form of separation for some time now, due to the fact that I have been in Europe for the past two months. "I think it is prudent that I withhold any further comment on this situation until I have had a chance to talk to Jill in person on my return to Los Angeles." McCallum is starring in Three Bites of the Apple... He is best known for his role as Illya Kuryakin in The Man From U.N.C.L.E. television series. These comments are authentic McCallum -- a few brief sentences devoid of anything remotely resembling excessive emotion. but then dignity has always been the hallmark of David's private life. He is known for discreet silence regarding his wife and children, so those who know McCallum best agreed that these words represented the most difficult public statement he had ever had to make. Only when silence was no longer possible did David speak out. The words, seemingly simple in form, must have come as a result of a complex and desperate situation. They are the equivalent of a ringing emotional confession from anyone else. The statement did not wholly surprise many people in Hollywood; but it did catch even the most inside insiders off-guard. For the timing was unexpected and thence baffling. Why did David find it necessary to release the statement from Italy when he was due back home within a few weeks? Why, when in "polite circles" it is the wife who customarily makes such announcements, was it David who issued the statement? If there is a divorce, is David's precedent-setting pronouncement a revealing prologue to legal fireworks, or will the rest of the situation be handled in his typical hush-hush manner? These are but a few of the many questions pertaining to L'Affaire McCallum -- questions which, at the moment, have no apparent answers. it must, therefore be assumed at this time that there seems to be very little chance of survival for the McCallum marriage. David felt obligated to make a public comment immediately; hence he must have felt backed against the wall. On May 11th, 1957, in London, England, 21-year-old actress Jill Ireland became the bride of 24-year-old actor David McCallum, Romance led to marriage in record time. For nine years they weathered many storms seemingly unscarred -- until lately. Still, in candid moments, David admits that a longer courtship might have made the early years of their marriage easier. At the beginning of the second week after their meeting, Jill invited David to her twenty-first birthday party. For a week following the party, they worked together by day and dated by night. Somewhere during that week David proposed. At the end of that week they were married. From the very beginning, there was an ever-present rival present in the McCallum household. That rival was ambition. David was at a point where succeeding as an actor was of paramount importance. Because of his love for Jill, not despite it, he worked harder than ever to achieve that success. Jill, at the time, was far better known than David and much more successful. She was accustomed to the adulation of fans and to seeing her name in print and her face on magazine covers -- with regularity. David was only a promising young actor, just making his second film; he had nowhere to go but up, and he was eager to get there as rapidly as possible. David may have seemed soft-spoken and shy to the world, but Jill knew from the beginning that she had married a dynamo -- a man consumed with ambition and gifted with great talent, hungering for the opportunity to make his ability know to the public. Because of her love for him, Jill began almost immediately to sublimate her own professional desires in a constant effort to reassure her husband and to keep him going when the breaks did not seem to come fast enough. Early in their marriage, Jill discovered a facet of David's personality that she feared might hinder him severely in his career. He was unable to take criticism and fell victim to moods of silence whenever anyone offered constructive help. Jill, deeply in love, transformed this flaw into an asset by offering him love and encouragement along with subtle constructive suggestions -- which, to his credit, he eventually accepted. During this time, Jill's own career became secondary. But it was a sacrifice she made freely and happily. During the early months of their marriage, David spent a great deal of time away from home -- studying, doing try-outs, on long interviews, or at work. When he finally did come home at night, he was too tired to talk. When they did talk, the conversation centered on his problems, his career, his struggle for success. Jill made some attempts to return to work, but there were lonely gaps in the days that stretched into weeks. She sought to fill them with the creative outlet which next to acting satisfied her most. She began to paint in earnest. She acquired a new set of friends, the majority of them artists, painters and sculptors. With them, and through them, some of Jill's empty hours were filled. Four months after they were married, Jill became pregnant. She did not have an easy time and was forced to spend more and more of her days at home. Her husband, proud of the coming event, was nonetheless still consumed with his career. He was insufficiently aware of his wife's increasing loneliness. There was no deliberate attempt to hurt Jill or to shut her out. But Jill found the going rough. It was only in later years that David realized what he had done to his wife. From that moment, he worked desperately to make up for the early errors of omission. On June 2, 1958, a son, Paul, was born. He lent new dimension to their love. A child meant increased responsibilities, and in their common goal to ensure their son's future security, they were drawn closer together. In the second year of their marriage, David had an opportunity to do a film called Caroline, to shot on location in Yugoslavia. Leaving their son with Jill's parents, the McCallums went off together. It turned out to be a wonderful interlude -- a second honeymoon -- when trouble seemed to disappear in the wake of shared happiness. but on their return home, David reverted to his pattern of working day and night to reach to top. By this time they had bought a large home, and Jill was kept busy with her young son and with redecorating the very first place she and David owned together. Meanwhile, David decided the time had come to re-examine his plans for career. Realistically, he concluded his future in England was limited. he hit on a possible alternative -- a long shot at best. But he reasoned that if he could not make the impact he wanted in England, there was one place left which could possibly afford him the chance to rise from obscurity to fame. The place he picked to gamble in was Hollywood. Once formed, he set the idea into motion. His first step was to go after a part in a Hollywood film locationing abroad. He got it -- he was offered a role in Freud, starring Montgomery Clift, directed by John Huston, and to be filmed in Munich, Germany, only an hour and a half by plane from his London home. It was a turning point in David's life. Through Mr. Huston, David was introduced via mail to a famous Hollywood agent, Paul Kohner, who was soon to play a key part in McCallum's destiny. A few months later, the break came. David was cast in another American film, also locationing in Munich, The Great Escape, to be produced and directed by John Sturges. David and Jill went to Munich together. His original small part developed into a larger role. He and Jill were away for several months. During the course of the filming, the McCallums became quite friendly with other members of the cast, including Steve McQueen, James Garner -- and Charles Bronson. Bronson and the McCallums hit it off especially well. David had been a fan of Bronson's for years, recognizing him as one of the most outstanding American character actors. The McCallums and Charles Bronson soon found they had even more in common than acting. For Bronson, though rough-and-tumble looking, is actually a talented artist. He had painted and worked with clay sculpture for as far back as he could remember. The three were drawn into close friendship. During the filming, Jill was suddenly taken quite ill. Her ailment was both serious and painful, and she was confined to bed for a portion of her stay in Munich. Out of kindness, on those days when David was filming and he was not, Bronson kept Jill company. So it was in September, 1962, on location in Germany, that David and Jill McCallum first became indebted to Charles Bronson for his consideration and friendship. While David was still in Munich, agent Paul Kohner arrived in Germany. Mr. Kohner was able to arrange a screen test for David -- the part of Judas in The Greatest Story Ever Told. John Sturges gave David a week's leave to fly to America. Early in October, 1962, David McCallum landed in Hollywood for the first time. He was excited, he was in awe of the town itself -- and the enormity of the possibilities which could be his -- if his screen test pleased George Stevens. The week ended, the tests were completed and David anxiously awaited a decision. But none was forthcoming. He flew back to Munich, down-heartedly convinced that his career in Hollywood had begun and ended with a screen test. He had not been back in Munich 24 hours when he received a call. He had won the part, and was expected to return immediately. On October 16, 1962, David and Jill McCallum and 4-year-old Paul arrived in America. David had rented (sight unseen) a posh home in Beverly Hills, costing roughly $2,000 a month -- because he thought that's what all Hollywood actors paid for their homes. On the day that David and Jill moved into their new home, David left for Arizona on location. He had made provisions in his contract for his wife and child to visit him during the filming. but he landed in Arizona to find the Stevens' company bedded down in a mountain wilderness; once the company arrived, nothing could fly in and nobody could fly out. For several months, David was torn by loneliness and concern for Jill, alone in a strange town, knowing no one except their agent and Charles Bronson. After a few months, he could take it no longer. He broke the rules, left the compound, rented a motel suite 12 miles from where they were filming and sent for his wife, his two sons (baby Jason had arrived in January, 1963), the nurse, and even the family cat and dog. Happily they were reunited. When the filming was over, the McCallums faced a serious decision. What and where was their future? Should they return to England? Should they remain in America and wait the long months for the premiere of The Greatest Story, in the hope that David's performance would bring him other offers? Should they perhaps try New York for TV and stage possibilities? Or, despite limited finances, should they stick to David's original goal, and struggle along in Hollywood? At this crucial point in their lives, Jill discovered that she was pregnant again. So they decided to stay put for her comfort. They moved to Malibu Beach, to a cottage on the sand wit the Pacific Ocean in their front yard. It was a happy time for them and their two children; the boys had playmates close by, the children of Charles Bronson who also lived in Malibu. While Jill awaited the birth of her third child, David was offered the part of Illya Kuryakin in a proposed series called The Man From U.N.C.L.E. The Kuryakin character was so intangible that the producer of the series could not guarantee David it would run beyond the first eight or ten episodes. By some sound instinct, and good luck, McCallum accepted the part. David and Jill now looked to establish roots. They went house hunting. Coincidentally, Charles Bronson was also house hunting... It was he who found the multi-storied Spanish-style home, hugging a Hollywood hillside. Enthusiastically, he showed it to his friends; gallantly he stepped aside, and the McCallums bought the house. David and Jill were on the threshold of an oft-recorded chapter in their history. In rapid succession they moved into their new home, baby Valentine was born, and filming on U.N.C.L.E. began in earnest. Their marriage was strong and secure -- they were heading into the happiest times of their life -- fame hit suddenly, swiftly -- and in an unexpected form. David McCallum became overnight a teen-age idol -- and began losing his home at one and the same moment. He stoutly maintained that no amount of idol worship could unsettle him. But he fell victim to the same hysteria that has overwhelmed idols before and will again tomorrow. At first, the publicity, the interviews, the magazine stories were fun. Then the crackdown came. It all started when a movie magazine ran a photo of Jill McCallum and Charles Bronson attending a Hollywood soiree together -- without David. The truth was that David had been forced to stay late at the studio, and had asked Bronson to be a good chap and take Jill to the party. It was an act of friendship which triggered the first of the many rumors, the vicious gossip, about Bronson and Jill. From then on, McCallum's attitude toward the press took a downhill turn. His lack of cooperation came simultaneous with the peak of his popularity. He was advised by "experts" that he could afford to give a terse "No comment" when asked about his wife and sons. For he was a star. Ironically, it was just this attitude which led a bewildered press, not accustomed to being shut out, to exaggerate whatever was available. Had David proved more accessible, perhaps the Jill-Charles rumors would have died out. David's determined silence lent fuel to the flame. But for the first time in his life, David felt totally independent -- he was in a position where people were clamoring for him. The work schedule at the studio was augmented with out-of-town trips, well-paid guest shots on other TV shows, and a recording contract. So the period in which David and Jill should have experiencing their happiest times turned into a nightmare followed with loneliness, tension, frequent separation -- heartache. Some say that in her despair, Jill McCallum turned more and more to Charles Bronson for solace and companionship. Others say this is not true, that Charles had always been a close friend to both David and Jill. Whatever the truth, the facts are that Jill Ireland had gone to the altar with a promising young actor, only to become the wife of America's newest idol. She was not jealous of his success. And he, in turn, went out of his way to woo her again, to bring her gifts, to take her out dining. His intentions were so very decent and honorable -- but his success increasingly came between them. Jill, a woman of great sensitivity, was possessed of the pride that goes hand in hand with this sensitivity. and it was her pride that had been hurt most deeply -- the wounded pride of rejection compounded by loneliness and the need to smile for the world. In an attempt to smooth things over, Jill made a few location trips with David. It did no good. Her husband was as busy outside of Hollywood as he was inside Hollywood. Jill only faced more hours of loneliness. Somewhere along the line, Jill reached out to David for confirmation of his need for her -- of his love. It is a certainty that he did no intentionally fail her, that he did not purposely commit that final hurtful act. But nonetheless it happened. When it did, it was the beginning of the end. Publicly, Jill hid her hurt by opening an art gallery with Charles Bronson and a third artist. It was a wonderful outlet, she said: but those who knew the situation realized it was only one more tangible proof of the ever-widening gulf between Jill and David. The gallery also served as a perfect excuse for Jill to remain behind when David went to Europe to being work on his new film. So David went abroad and Jill remained behind with her sons. And more and more frequently, people saw Jill and her business partner Charles Bronson out together. Then, a month after David left town, Bronson also headed for England to do a film. Robbed of the companionship of both her husband and her good friend, the danger point came for Jill. Jill and David were "in communication." And then the separation became official. Meanwhile, a touch of irony chanced on the McCallums. While David was abroad, Jill was signed to co-star in a new television series. She will play the female lead in Shane. So, after two years of sitting at home while David spent his days and nights on a TV sound stage, Jill Ireland McCallum was about to begin the same routine. What if Shane had happened at the same time as U.N.C.L.E.? Would the combined success and productivity have helped the twosome? Who can answer for the past? At this moment, the McCallum future is up in the air. Jill herself, according to reports from Hollywood columnist Harrison Carroll who spoke with her, is rather silent on the subject of the future. She has said that neither she nor David talked with attorneys, and she will not discuss divorce until David returns from Europe. But she did firmly stress that she and Charles Bronson are nothing more than "business partners." Knowing what has happened these past few years, one could well ask of David, "Was it worth it?" And McCallum might answer, as the character from his latest film The Great Escape does, "It all depends on your point of view." Surely, from David McCallum's current point of view, he is paying quite a price for success, for fame, for the financial security he worked so hard to achieve.